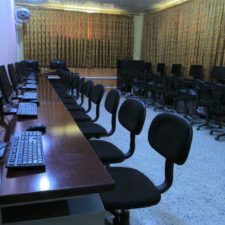 To provide practical lessons, one computer lab at the main branch is equipped with sixteen computers and two computer labs in Barchi Branch are equipped with sixteen and eighteen computers with models OptiPlex Dell 9020 & 9010, 7010. Kateb University is equipped with a reliable networking system with models by approved topologies such as Cisco. There is both Cable and Wi-Fi networks for quick communication and administrative issues faced. The IT department at the Central Branch and Barçhi for communication, information and internet affairs has a fully active internet portal. Full speed, equipped with Secure Networks, Dedicated Broadband 8Mb Forwarded. The Main Branch Internet Club is equipped with 18 computers and the Barchi Branch is equipped with ten computers with models OptiPlex Dell 9010 & 7010. The Internet Club in the main branch is equipped with 18 computers and the Barchi Branch is equipped with ten computers with models OptiPlex Dell 9010 & 7010.